"1987: When The Day Comes"
It is a perfect example of alternative Chinese narrations, created within the medium of the animated film, whose seemingly innocent form can cloak its subversive contents. The Wednesday lineup also includes the last screening of a competition film – in "In the Life of Music," its makers Caylee So and Sok Visal portray the life of a family marked by the trauma of the Red Khmer regime, using one of the songs of the legendary 1960s pop star, Sinn Sisamuth, to recreate the world from before the political upheaval. The two last screenings of this year's Five Flavours are a chance to look at the key historic events in South Korea and Taiwan from today's perspective. In Kinoteka cinema, "1987: When The Day Comes" by Jang Joon-hwan, a multi-sided recreation of a complex series of events leading up to the democratic protests at the end of the 1980s in South Korea, which led to overthrowing the authoritarian rule, and a gradual introduction of democracy. 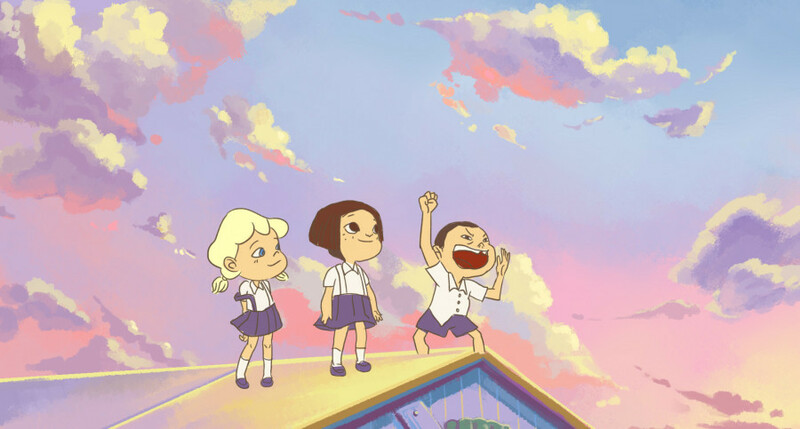 The official closing film of Five Flavours is a Taiwanese animation "On Happiness Road." The director, Sung Hsin-yin, spins a very personal tale of growing up in Taiwan in the times of dramatic political and social changes – from the 1980s and the protests that brought democracy to the island, to the contemporary economic stagnation and a crisis of identity. The form of the animated film lends extra depth to the story, which is also tied to the process of making the film. At 8:30 PM, during the closing gala of the festival, People's Jury will announce their verdict – the winner of the honorary Grand Prix of the 12th Five Flavours AFF. After the screening of "On Happiness Road," in the foyer of our host cinema Muranów, the audiences will enjoy snacks and drinks prepared by festival friends – herring snack specialists, Leniwa Rodzina, and Choya, the producer of wonderful plum wine. This is the finale of the 12th Five Flavours and the beginning of a year-long wait for its 13th edition. According to the 2019 Chinese lunar calendar, it will be be held under the auspices of the Earth Pig.